The arrival of this year's Field Trip music festival happening at Toronto's Fort York on June 7 - 8 has had one unexpected side-effect on one of its participants — a shortage of good rehearsal spaces. 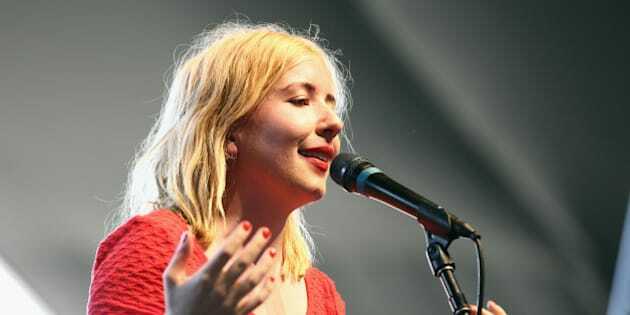 "When we were trying to book a rehearsal space before Field Trip it was impossible," said Austra lead singer Katie Stelmanis of a bill that will feature fellow Toronto-centric acts such as Fucked Up, The Darcys, Do Make Say Think, BadBadNotGood and the new Feist-Snowblink-AroarA project, Hydra as well as internationals like Interpol and The Kills. "Like, all the spaces that we normally go to were booked. One of them was, 'Oh, you know, Broken Social Scene is probably going to take it so we can't give it to you...' So it was just ridiculous." While the top of the bill will feature yet another Voltron-like reformation of Broken Social Scene family, dark electro dance act Austra have been no slouches in the community building department either. Stelmanis, drummer Maya Postepski and bassist Dorian Wolf are at the centre of a Pete Frame-style family tree that also includes Postepski's solo work as Princess Century as well as her TRST collaboration, Wolf used to be in Spiral Beach, whose Airick Woodhead is now part of Doldrums. Sari and Romy Lightman of Tasseomancy used to sing backup in Austra and have worked with Timber Timbre, and Stelmanis has recorded in the past with Fucked Up and Bruce Peninsula. They've also got connections to indie breakouts Diana and aspiring pop star Allie X. "I've been playing music now for such a long time and I used to play music under my own name for a few years and my band was basically a revolving door of musicians," said Stelmanis. "You know, I had so many people coming in and out. So it's not unusual that I've had like a ton of Toronto musicians play with me before and now so many of them are making a name from themselves which is kind of cool. "Like, Carmen (Elle) from Diana used to be in the band way back when. Allie Hughes who is Allie X used to play in the band, which is kind of crazy that she's becoming a pop star now. And then yeah, Princess Century has always been doing her own thing. She kind of found Robert (Alfons, TRST) somehow who was making this amazing music on his own. And Maya was like, 'You'll never believe who made these songs.' I remember she was really excited when the whole TRST thing started." As Austra's importance as an anchor in the Canadian music scene becomes more obvious, Stelmanis has likewise become a firmer presence as well, particularly through her blog. The openly gay singer's recent posts include "Are opera singers now to be judged on their looks not their voice," a takedown of hipster headdress and a poll of sorts on the best way to communicate her "radical feminist agenda." "You have a direct communication with the fans," said Stelmanis of the blog. "And I think that it's kind of a lot more obvious if you're not speaking out about something. Like maybe, depending on the type of artist you are I feel like some artists people have an expectation of them to be vocal about certain things." The Isla Vista killing spree and subsequent #YesAllWomen Twitter movement is another example of standing up and being heard. "That hashtag spread over the internet," said Stelmanis. "I mean, I was sitting in a hotel in America watching CNN and they had three women talking about feminism, basically. Talking about the plight of women in America, the plight of women around the world. "And it was a discussion that otherwise never would have been on CNN. So I think it's kind of amazing — obviously it's a horrible tragedy — but at the same time it was able to make these discussions very visible and mainstream which I think is a positive thing [to build from this]." Speaking of building, on top of the Field Trip appearance the band'll be releasing their new "Habitat" EP on June 17. That date holds a certain significance in the Austra universe because they released their "Olympia" album on that same date last year. Stelmanis says it wasn't intentional. "I'm actually surprised at that coincidence," said Stelmanis. "All I know is that 'Olympia' came out the same day as [Kanye West's] 'Yeezus,' which I think was kind of difficult for us. And I know that our EP is coming out the same day as Lana Del Rey's record so I think that we're kind of shooting ourselves in the foot a little bit by constantly choosing that day." Although it's only now getting its official release, the song "Habitat" has been in the Austra setlist for years, with the band having first performed the song in 2011. "We wrote it before [2011 album] 'Feel It Break' came out so it's been around a long time," said Stelmanis. "We took this opportunity [to release it now] because essentially, yeah, we could do whatever we wanted. We already had 'Habitat,' the single, so it didn't matter what the other songs were. So we kind of had a little bit of fun with it, kind of exercising our efforts as producers more than anything else." The soon-to-be-released "Habitat" video directed by Matt Lambert had what Stelmanis considers a fortuitous connection. "It kind of takes place in a love hotel and it's kind of focusing on these different intimate love stories within that setting," said Stelmanis of the video. "But the thing that's cool, we filmed it in Scarborough, I found out later that we filmed it at the same hotel as 'Hedwig And The Angry Inch.' So I felt like that was very auspicious."